Dementieva's first official tournament of the year was in Sydney, Australia, where she lost in the second round to Li Na 3-6, 6-1, 7-5 after being up 5-2 in the third set and holding five match points. At the 2007 Australian Open, Dementieva matched her career best result at this tournament by reaching the fourth round, where she lost to Nicole Vaidisova 6-3, 6-3. 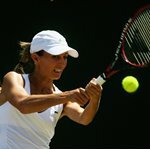 Dementieva unsuccessfully attempted to defend her singles title at the Toray Pan Pacific Open in Tokyo, losing her semifinal match to Martina Hingis 6-4, 6-3. Because of an injury, she could not participate in the tournament in Paris. Without having fully recovered, she played again in Antwerp but had to retire from her second round match against Elena Likhovtseva. She then travelled to Indian Wells, California to compete in the Pacific Life Open but withdrew from the tournament at short notice. 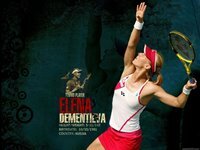 Dementieva returned to playing tennis in the Tier II Warsaw event, where she lost in the second round to Venus Williams. At the Tier I Qatar Telecom German Open in Berlin, Dementieva lost to Nadia Petrova in the third round 6-3, 6-3. At the Tier I Telecom Italia Masters Roma in Rome, Dementieva lost in the quarterfinals to Jelena Janković 6-2, 6-1. In her final tune-up event to the French Open, Dementieva won the Istanbul Cup, defeating Frenchwoman Aravane Rezai in the final. This was her seventh career WTA tour singles title.